A new report on terrorism from the U.S. State Department says that for the second straight year, terror attacks and deaths are down. Global terrorist attacks and fatalities from terrorist attacks were down for the second year in a row in 2016. That's according to the U.S. Department of State's annual Country Reports on Terrorism, which showed a 9 percent drop in attacks and 13 percent drop in deaths. So while globally terrorist attacks and deaths are down, the report also notes the Democratic Republic of the Congo, Iraq, Somalia, South Sudan and Turkey all saw an increase in attacks and deaths. Related Story After ISIS Falls, What Happens To Its 'Digital Caliphate'? Fifty-five percent of all attacks in 2016 were in just five countries — Iraq, Afghanistan, India, Pakistan and the Philippines. And while ISIS and Al-Qaeda remain the most potent terrorist organizations in 2016, both groups have suffered considerable setbacks — losing both territory and important leaders. Numbers for ISIS' propaganda distribution and media outlets were also down in 2016. 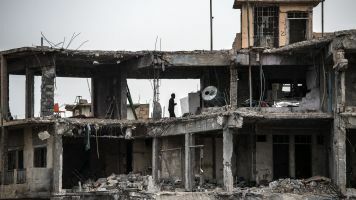 Iran was once again designated as the foremost state sponsor of terrorism, with the report citing the Iranian Islamic Revolutionary Guard Corps and Iranian proxies as destabilizing forces. Sudan remained a designated state sponsor of terrorism, but there were no indications it was supporting any terrorist organizations in 2016. President Donald Trump recently extended the deadline for a review period on easing trade sanctions against Sudan.